On my Mac, for my Kenwood radios I have been a very happy customer of MacMemoriesManager for a number of years. “What?” you say? A Mac? I thought this guy was a ham radio operator? We all know Hams use Windows (preferably Windows 3.1 or Windows 98 right?) or Linux! Well, the Macintosh platform is continuing (although slowly) to grow for amateur radio, I really thank those Mac developers, I know they would sell more software if they sold to the larger community, but with the high quality designs Apple has been putting out over the last few years, more and more hams will be switching, especially as quality software is available for them. Okay, enough of me praising Apple, back to what I was talking about. 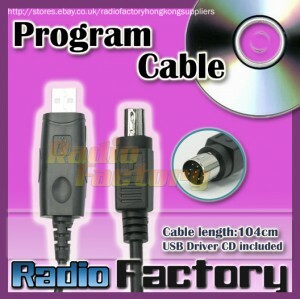 So I wanted to start programming frequencies to the FT-817, so I headed over to eBay and found a USB data cable for it from 409Shop.com who goes by the name RadioFactory on eBay. I received the cable and a small cd with drivers on it. I never opened the driver CD as I’m sure it was Windows only, and those tiny CD’s won’t work safely in slot loading cd players I don’t think. Didn’t need it anyways, I already had my USB driver installed since I use similar cables for my Kenwood radios. These cables use the pl2303 Serial to USB chip, and that led me to the SourceForge project: PL2303 USB to Serial Driver for Mac OS X. I have noticed that Apple has a link to that same SourceForge project as well. First, it kept saying the radio couldn’t be found. Apparently the radio has to be in VFO mode, not memory mode to be programmed. Second, I got it to connect, but only about one in five of the memory channels would get programmed successfully, garbage data was being written to the file, sounded like a baud rate issue. I reduced the baud rate to 4800 in MacMemoriesManager, and also reduced the rate on the radio and data started flowing perfectly! To change the baud rate on the radio, turn the radio on, push and hold the “F” key, navigate to menu item 14 using the SEL knob, then choose 4800 for the rate, then push “F” again to get back to your regular modes. One of the things I really like about using MacMemoriesManager is that since I already had all of my frequencies programmed for the Kenwoods, I was able to open up that memory file, switch the radio to use in the software, and then send those frequencies right back in to the 817 so frequencies can match across all three of my radios and I never had to type them back in again. Only downside was… the 817 doesn’t receive 220 MHz, and won’t receive the fire department frequencies I use most often, so I had to delete all of the frequencies from the memories that were outside the receiving range of the 817. A wider band receive sure would have been nice for this, I guess I’m just spoiled by my Kenwood TH-F6A! I’ve been having a lot of fun playing with my Kenwood TH-F6A over the past months, been using it more to get on the air recently. I even joined ARES, Santa Cruz County Amateur Radio Emergency Service. I’d listened to their nets occasionally over the years and after I heard Cap Pennell (KE6AFE) talking with someone about the new sign-up form, I figured I could easily both help with testing the form and get myself sign up at the same time. But the bigger update is that I’m having radio troubles! I often am adding, changing, or re-ordering frequencies on this thing, and starting last night, my data cable is no longer working. As I’ve mentioned previously I use MacMemoriesManager on my MacBook Air. It’s been working great all this time, but now the software keeps reporting that it can’t find the radio. First I tried a Menu Reset on the radio, then a VFO reset, and as a last resort I tried a full reset. Now I’ve got a blank radio and no way to program it via the cable! If I get a few minutes tomorrow at lunch I’m going to try to run over to Ham Radio Outlet in Sunnyvale and see if they can take a look at it. I noticed that the double plug seemed like it was a bit firmer going in, so my guess is one of the small internal contacts inside the jack has bent out of position.